Well, there will be no surprises in this series. Chicago and Vancouver have met in the Western Conference Playoffs in each of the past two seasons. Those matchups have occurred in the second round and Chicago has advanced victorious each time. Now, they play in the first round and someone will be going home earlier than expected. Will it be Vancouver again? Only time will tell. The Canucks, however, are a far different team than either of the previous two editions – more dynamic on both offense and defense. Chicago, too, is a far different team. They did not cruise through the season like last season. Instead, they needed a minor miracle in the season’s final game just to qualify for the postseason and earn the honor of playing the League’s best team. But, as each of the past two playoff series between these teams have proven, trends will matter little when the puck is dropped here in Game 1. When not in uniform, it can be hard to tell Daniel and Henrik Sedin apart; but on the ice it's common to find Henrik (NHL-leading 75 assists) setting up the goals and Daniel (NHL-leading 104 points and 41 goals, ranking him fourth) lighting the lamp behind opposing goaltenders. Even for opponents who can contain the Sedins, Ryan Kesler (career-high 41 goals, accompanied by 73 points) has provided scoring depth while playing on a line with Chris Higgins and Mason Raymond. Being able to rely on those players, as well as guys like Mikael Samuelsson and Alexandre Burrows, for secondary offense is a major reason why Vancouver led the League in goals with 262. A serious eye injury will keep defensive stalwart Manny Malhotra out for the postseason and Raffi Torres will miss the first two games while finishing out a suspension incurred for an elbowing incident at the tail end of the regular season. The Blackhawks might have waited until the final day of the regular season to get in, but by no means are the defending champs a pushover. Perhaps, the biggest reason is because they are loaded at the forward positions. 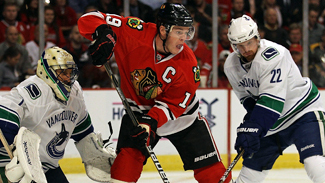 The key players are Jonathan Toews, Patrick Kane, Patrick Sharp and Marian Hossa. Three of them will make up the Blackhawks' top line heading into the playoffs, while the fourth guy -- for now Kane -- makes the second line that much more formidable. Kane has been skating with Michael Frolik and rookie Ben Smith -- and the trio has shown chemistry in just three games together. Sharp is admittedly not 100 percent, but he has shown no ill effects from the knee injury that kept him out of seven games before he pulled off a minor miracle and returned about week earlier than anticipated. A key guy to the Blackhawks making another deep run is Dave Bolland, who goes by two apt nicknames, 'Greyhound' and 'Rat.' Bolland missed the final 14 games of the regular season with a reported concussion but he was back skating Friday and the Blackhawks are not ruling him out of Game 1. Bolland has proven this year he can be used in an offensive role as a second-line center, but he's also so good in a checking-line role. He was maybe the Hawks' unsung MVP in the playoffs last season because he had a direct impact on shutting down the Sedin twins from Vancouver, San Jose’s trio of Joe Thornton, Patrick Marleau and Dany Heatley, as well as Philadelphia's Mike Richards. Injuries have plagued the Vancouver blue line for much of the season; fortunately the Canucks are deep on defense and replacements have fit in seamlessly. Even better news is they appear to be getting healthy at just the right time. Alexander Edler came back late last week after back surgery had sidelined him since January, and Dan Hamhuis, who has battled concussion issues, was practicing with the team with an eye toward being back for the playoffs. Sami Salo played fewer than 30 games this season but he's healthy heading into this series, as are Keith Ballard, Kevin Bieksa and Aaron Rome. Vancouver’s only defenseman to make it unscathed from October to April, Christian Ehrhoff, finished fifth on the team in scoring with 50 points. This is an experienced, veteran group that only gets tougher to play against if Hamhuis, a free-agent signing during the summer, comes back 100 percent. When a No. 6 defenseman can join a No. 1 and make a more than serviceable pairing, there is enviable depth on a team’s blue line. Blackhawks coach Joel Quenneville likes to put rookie Nick Leddy with reigning Norris Trophy winner Duncan Keith at times; but he might start the playoffs using the Olympic tandem of Keith and Brent Seabrook. He can't go wrong with that pair either. Keith hasn't had the same type of season he did last year when he won the Norris, but he has still been good to great for the most part and he played his typical tight, speedy, big-minute games against the Red Wings in the end-of-the-season home-and-home. Keith logs huge minutes for the Blackhawks but he says he's not tired, though he admittedly went through a lull at the beginning of the season. Seabrook surprisingly led all Blackhawks' defenseman with 9 goals and 48 points. He is a crafty offensive player but is best known for his physical prowess on the other end. Leddy has shown a lot of growth in the second half of the season and he might have the best shot of any of Chicago's top six defensemen. Chris Campoli might have been the most important pick-up for any team at the trade deadline. The Blackhawks got him for Ryan Potulny and a conditional second-round pick and he's been lights out for them. Campoli joins the rush and can contribute offensively, but one of the best things he does for the Hawks is stand guys up at the blue line. He's not a big hitter, but he's effective. Brian Campbell and Niklas Hjalmarsson are the likely second pair and the Hawks like them together because of the mix of power and speed. The only knock on Hjalmarsson is that he coughs the puck up too much and he's not always physically engaged. Roberto Luongo had a first-rate season in Vancouver, even by his own lofty standards. He tied for the League lead with 38 wins, was second in goals-against average at 2.11 and came in third with a .928 save percentage. It was the best GAA of Luongo's career, almost a half-goal per game improvement on last season, and the only time he had a better save percentage was when he posted a .931 in his next-to-last season in Florida. The emergence of Corey Schneider as a more-than-capable backup was huge in allowing coach Alain Vigneault to limit Luongo's workload. After he appeared in 76 and 73 games in his first two seasons with the Canucks and another 68 last season, Luongo has only 60 games under his belt and should be fresh for the playoff run. Corey Crawford didn't begin the season as the Blackhawks' No. 1. That job belonged to Marty Turco. Well, Turco hasn't started since Feb. 11, so what does that tell you? The argument can be made that Crawford was Chicago's regular-season MVP. He started the final 27 games and won 16 of them with two shutouts and four other one-goal games. Crawford, who spent the past four seasons playing with Rockford of the American Hockey League, finished his rookie season with 33 wins, a 2.30 goals-against average, .917 save percentage and 4 shutouts. Just like Antti Niemi last season, Crawford will be making his Stanley Cup Playoff debut. Chicago hopes his goes as well as Niemi's debut did. This will be Vigneault's fifth time coaching in the Stanley Cup Playoffs. Each of the previous four trips -- one with Montreal, three with Vancouver -- have featured a first-round series win, but he has yet to advance a team to the conference final. Although the Canucks would tell you there isn't any psychological hurdle that needs to be cleared after being eliminated in the second round each of the past two springs, keeping his favored team on an even keel should it encounter an unexpected bump in the road may be Vigneault's most important task. Quenneville won his first Stanley Cup as a head coach last season, but it was the second time his name got etched on the famous trophy. Quenneville was an assistant under Marc Crawford when Colorado won the Cup in 1996. He has coached in more than 1,000 games and is 10th all-time in wins with 578. Quenneville's better than .640 regular-season points percentage is the best in franchise history. His .640 postseason winning percentage (25-14) is the franchise's best since 1940. There was a point in the season when Vancouver topped the NHL both in power-play and penalty-kill percentage -- the Canucks finished No. 1 on the PP at 24.3 percent while slipping into a second-place tie on the PK at 85.6 percent. Even still, any team hoping to upset the Canucks will need to spend as much time as possible playing 5-on-5 hockey to have a realistic chance. Daniel Sedin's 18 power-play goals led the League, while Kesler chipped in 15 goals on the power play and another 3 shorthanded. Chicago's power-play success is indicative of the talent it has up front. The Blackhawks finished the regular season with the League's No. 4 power play at 23.1 percent. What's more remarkable is Chicago had such a good percentage despite finishing in the bottom five in overall power-play time. The penalty kill, however, left a little to be desired. Chicago was No. 25 on the PK this season with a 79.2 percent success rate. What's alarming is 28 teams were shorthanded more times than the Hawks this season, yet only a handful gave up more power-play goals. Ryan Kesler, Canucks -- Perhaps no player on either side will be counted on to have more of an impact at both ends of the ice than the seven-year veteran, who increased his goal output by 50 percent this season. But long before he threatened the 40-goal plateau, Kesler was a Selke Trophy nominee for his defensive abilities, which include killing penalties and winning faceoffs. Minus Malhotra, he's the best Vancouver has up front in those departments. Marian Hossa, Chicago -- He looks fresh, healthy and is playing some of his best hockey in a long time right now. Hossa can be a monster two-way threat for the Blackhawks and when he scores they usually win. They're 17-3-1 when he scores. Canucks will win if … Luongo plays anywhere near as well as he did during the regular season and all 12 forwards and six defensemen in the lineup play their part, the formula responsible for Vancouver setting franchise records in wins and points while leading the League in most goals scored (262) and fewest goals surrendered (185). Blackhawks will win if... Crawford isn't caught up in the moment and emotions of his first playoff appearance (not likely) and they are able to play well in the third period. Chicago had 14 games this season in which it failed to pick up a point despite being tied or leading going into the third period.